So, where to start..... Well, I'll quickly address the craziness going on in the photo on the right. That's everything out of our kitchen piled up there behind me. Why you might ask? 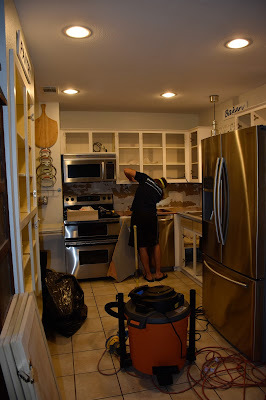 Well, because we thought it would be a great idea to do a kitchen reno a month before baby is due. Is that some out of control version of nesting or something? I'll revisit that topic with a couple more photos in a minute, but first, how about a little pregnancy comparison and update? This pregnancy has been different from the get go, that was what made me lean toward thinking maybe we were having a boy this time. It hasn't been night and day or anything, but different. A little harder. A little less fun. I don't know if that's all about the pregnancy or the fact that I've got Adelaide this time (although last time I had 17 four year olds in my class...), or maybe just because it's the second time around and the novelty just isn't there like it was the first time, or maybe the fact that Jordan's not doting on me at all like the first time around? I've missed that bit the most I think :( Whatever the reason, I am feeling more ready to not be pregnant this time than last time (heck I was totally into it up until the moment Adelaide was born), and I don't anticipate missing not being pregnant anymore like I did last time either. Okay, specifics.... Mercer moves way more. Like, 95% of the time or something. Like, right this minute, moving. When I wake up in the morning, moving. When I drive Adelaide to school,moving. When I get in bed at night, moving. When I wake up in the middle of the night (any of the 20 times), moving. There are definitely uncomfortable kicks and pokes and twists, which I don't remember having at all with Adelaide. Maybe he's bigger, or he's just preparing me for all the boy that is to come? I feel way more impeded. Like bending over feels like way more of a hassle. And rolling over at night or getting off the couch. I think my stomach muscles are way more shot this time. Also, I had a random few days of being woken up at night with indigestion/acid reflux about a week ago. None of that last time. On the plus side, I've only had one middle of the night leg cramp this time (knock on wood), which I battled with way more last time. I think I look a bit bigger; at least I 100% feel bigger this time. With Adelaide I strutted around feeling more confident about my body than I had in years; thinking I was just so cute and being totally happy with my looks. This time? Let's just say it's basically the opposite. The word whale comes to mind a lot. 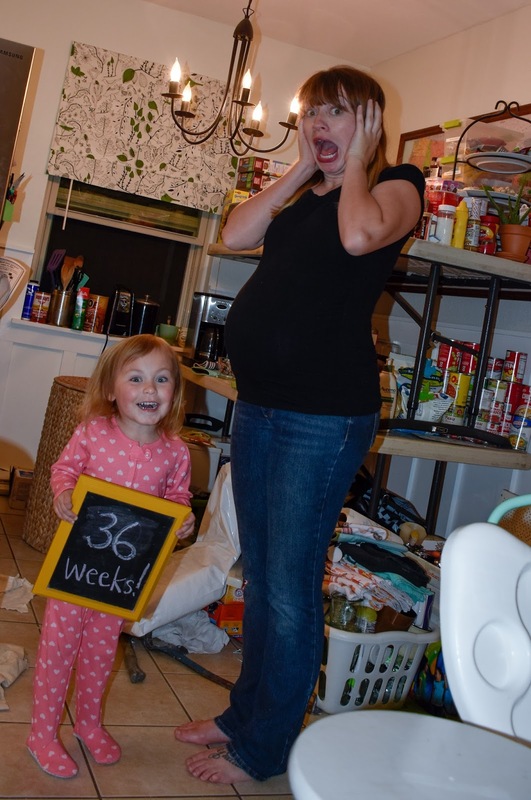 Also, this "weekly" photo was the first I've done since 20 weeks. I might've missed one or two last time. I'm thinking I'm already seeing just how much different #2 is going to be. I just don't bloody care this time! Haha! It's actually quite nice to be so much more laid back and I'm hoping that feeling sticks around. 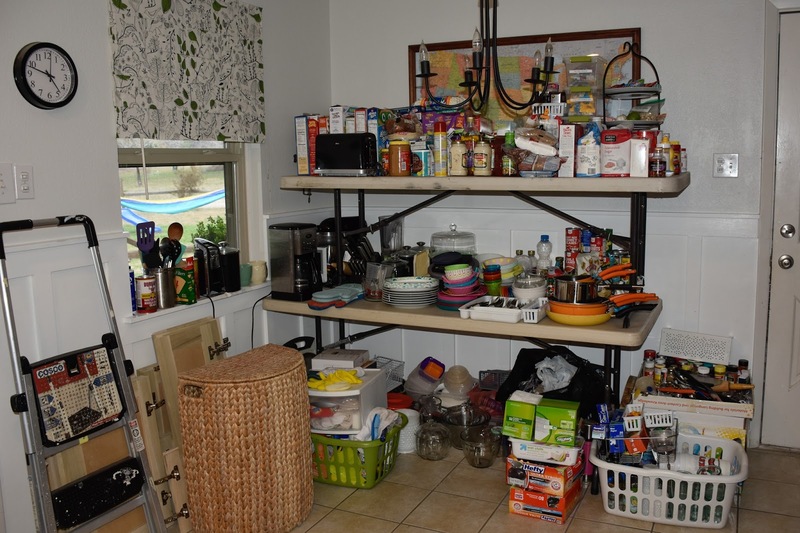 Okay, so onto the kitchen situation. So, this all started in January, when I decided to replace the cabinet doors. 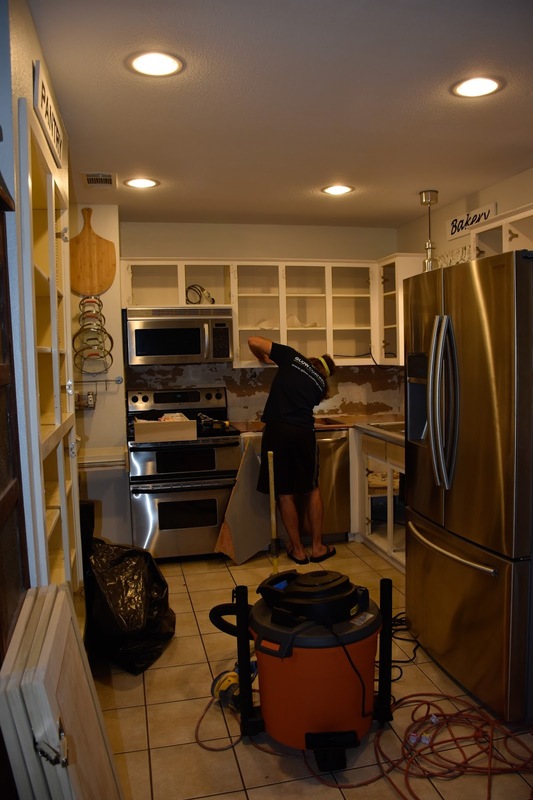 Not that Jordan was totally in the dark, we've had numerous conversations about the things we planned on doing pertaining to our house, we just never got past the first few steps before something else came up and it all got pushed to the back burner. This time, I was serious and I got it done. So, new doors = painting. Well, while we're at it, should we just go ahead and do the concrete counter tops we've been talking about for years? Let's do it! And the back splash (which I've wanted to change for quite a while now) is going to get messed up when we pull the counter tops out, so that's gonna have to go... So that's where we're at. As of today, the kitchen has been emptied for 3-4 days, (with no sink or oven or microwave access for 2 days) the doors and cabinet boxes have been primed and Jordan is about to start 1 of 3 (I think he said) coats of white paint! It already looks so much brighter in there, it's going to look amazing! That being said, it's a total pain the rear and I know Jordan is hating every second of it and cursing me in his head every step of the way. 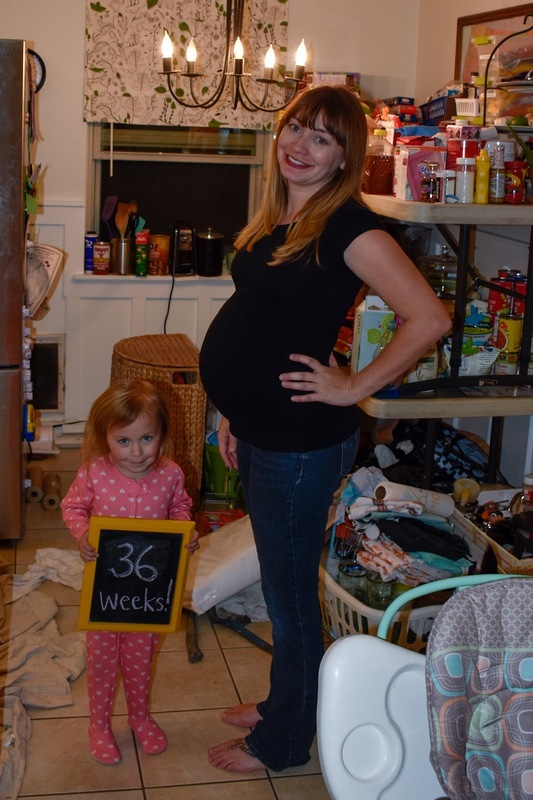 And I can't say crawling around on the floor scraping up old caulking or moving everything out of the kitchen while 36 weeks pregnant was a walk in the park. This is exactly the kind of thing he avoids at all costs. Once he's done with the painting though, he's going to start on the concrete counter tops, which I think he'll actually enjoy (of course, that's based on a scale where nothing is really want to be doing with your free time). He will of course enjoy the bragging rights and the praise that is guaranteed to follow, so don't go feeling sorry for him or anything. 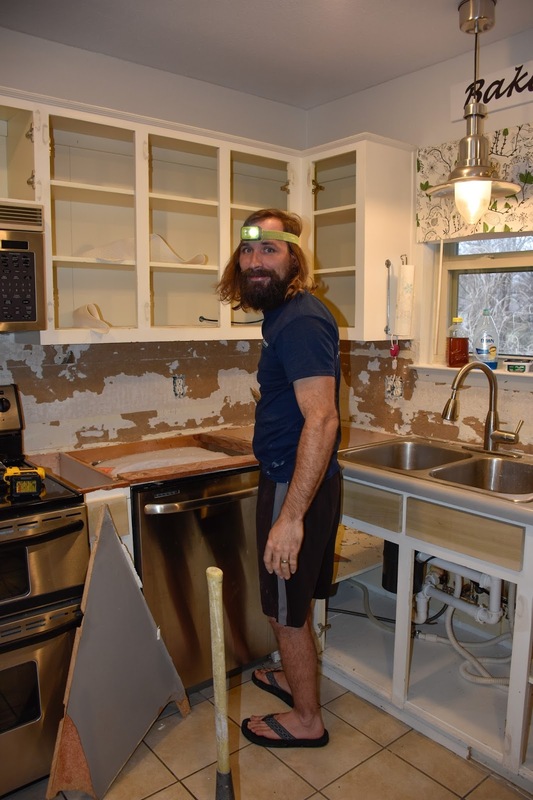 The plan is for the counter tops to get poured this weekend so that hopefully the sink can go back in by Wednesday, because Jordan is flying out Wednesday night for a few days of spring training in Arizona. And leaving Adelaide and I here for that many more days without a sink would just be mean. Not that I'd complain though, in all honesty. I'm just insanely stoked to have this all happening, finally! 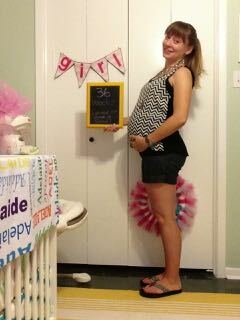 36 weeks pregnant or not. Yeah, we'd be totally screwed if Mercer decided to show up early, but it's a risk I'm willing to take. Like Jordan said, "Why take the smooth flat road when you can climb straight up the mountain on a cow trail?" (Which, incidentally, is exactly what he does on his motorcycle trips.) So he's serious when he says that.